This evening we (hopefully) have a chance to see a twice-in-a-lifetime event. Those of us in the East Coast are going to witness a Transit of Venus between 6pm and sunset. (For other viewing times and lots of other info go to NASA's website.) As it happens, we are partnering with a local middle school to do a 6th grade outdoor education camp, and this rare event falls on the first day! Since my lesson for tonight won't be usable again until 2117, I thought I'd share it with the masses. As with solar eclipses you SHOULD NEVER look directly at the sun. You could make a pinhole projector, but the Venus will appear as such a small dot on the sun that other viewing options would be more effective. Our students are going to take turns using Solar Eclipse glasses that we bought online, and looking through welding helmet glass (it is very important that you use at least Shade 14 glass). When I got both of these resources they were so dark I didn't believe they would work, but lo and behold I used them to look at the sun and got a perfect image. That really showed me just how powerful the sun's rays are (this is why we don't look directly at the sun....) We are also going to use binoculars to project the image of the sun, to see how that works. NEVER use your binoculars or telescope to view the sun unless you have the appropriate solar filters. Instead, with your back to the sun, you can point the telescope or binoculars behind you, and use them to project the image of the sun onto a white sheet of paper. We tried it the other day and it was pretty cool, so hopefully we'll be able to get an image big enough to see Venus. Below is some of the history about people studying the transits of Venus in recent centuries (this is my lesson plan for tonight's class). It's pretty fascinating stuff - sea voyages, wars, algebra, and more! Feel free to use it if you happen to have a group together tonight. All of my information comes from the NASA and wikipedia links above. Today we are talking about the Transit of Venus, which is what we call it when Venus passes between the sun and us. A Transit of Venus looks like a little black dot on the sun. Why do you think people have been so interested in the Transit of Venus? Since ancient times some people watched the stars and planets because they thought it would help them to predict the future and learn about the gods. It is believed that the Aztecs may have seen the transit of Venus in 1518. There is a jade figure in the British Museum, showing a god associated with the planet Venus, wearing the Sun as his neck ornament. Some people believe that this figure was a memorial to this event. If they did see this event, it might have been a bad omen – the explorer Cortez conquered the Aztec civilization two years later! In modern times people have been interested in astronomy because it can help us understand more about our solar system. 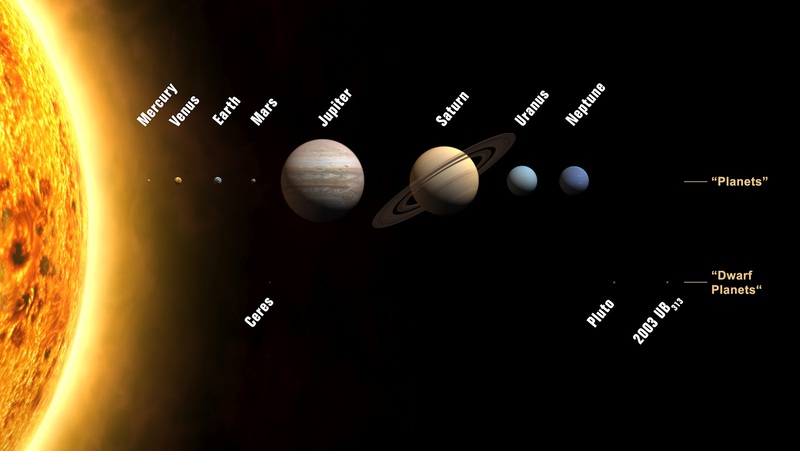 Have you ever made a model of the solar system? In the 1500’s Nicolas Copernicus created a model of what the solar system looked like, but he didn’t really know how far apart the planets are. He only knew how far they were in relation to the distance between the earth and the sun. In 1608 the telescope was invented, and in 1610 Galileo Galilee became the first human to see Venus as more than just a bright light in the sky. People became more interested in viewing events like the transit of Venus because there was so much that hadn’t been learned about the solar system. Another scientist, Johannes Kepler, was able to use math and astronomy to predict the 1631 transit of Venus, but he died in 1630 and was not able to see it. Based on his predictions, a French astronomer Gassendi looked for the transit, but it was not visible from Europe. Jeremiah Horrocks gathered his own data to improve on Kepler’s tables, and discovered that another transit would happen in 1639 – 8 years after the one Kepler had predicted. These transits often happen in pairs 8 years apart. 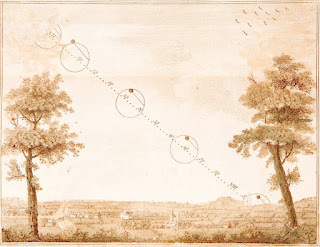 Thanks to his calculations Jeremiah Horrocks and his friend William Crabtree were able to see the transit of Venus – the first people in recorded history to do so! In 1716, Sir Edmund Halley observed a transit of Mercury, and realized that by observing transits, scientists could determine how far the Earth is from the sun. 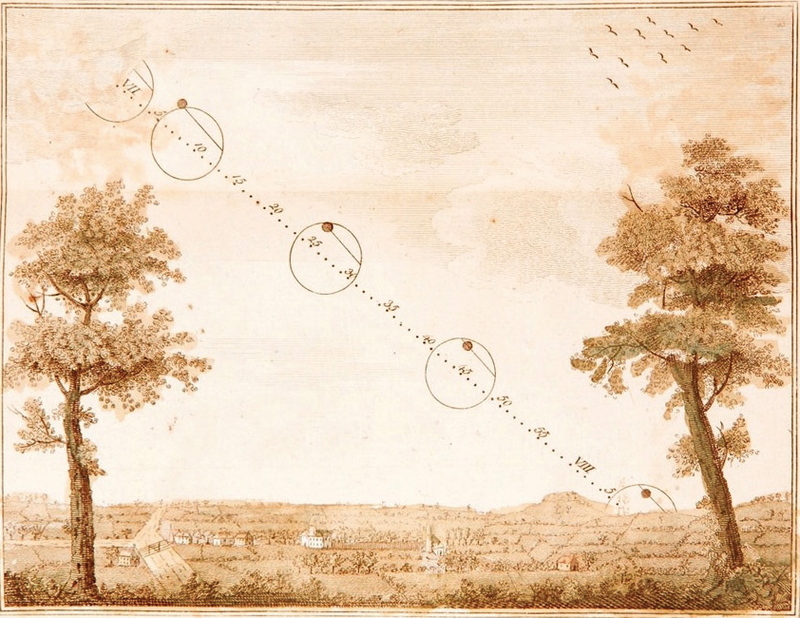 To get the most accurate data, he suggested that scientists should observe the 1761 and 1769 transits from as many places around the world as possible. How many of you have studied algebra in math? In algebra you sometimes have equations where you have to find the value of x, right? Well, in the solar system equation, the x they wanted to know was the distance between the earth and the sun. If they could figure out the distance between the earth and the sun, they could figure out the distances between the other planets. Halley died in 1742, but in 1761 176 scientists traveled to 117 observation stations around the world. Imagine what it would have been like to travel for months by sea, carrying delicate scientific instruments! To make things more complicated, the Seven Year’s War was going on between the French and English, but scientists were given special letters of passage. These were sort of like hall passes that got them safely through enemy territory. Benjamin Franklin observed the transit from the US. The most famous expedition was led by Captain James Cook. He left Plymouth, England in 1768 to circumnavigate the globe. Does anyone know what “circumnavigate” means? On his journey to circumnavigate the globe and explore the Pacific Ocean, he set up an observation station in Tahiti, an island in the South Pacific. Not only did he get pretty accurate data of the transit, but on the next leg of his journey he discovered New Zealand and got stuck on the Great Barrier Reef for a few weeks. He successfully completed his circumnavigation and returned to England safely as a hero. Photography was invented and developed in the early 1800’s, and scientists took hundreds of photographs of the 1874 transit. How many pictures do you take each day? In the early days of photography the process was very complicated and expensive so scientists could only take a few photographs. Unfortunately, technology was still not developed enough to accurately calculate the distance between the sun and the earth, even though over $1 million was spent internationally to collect data. John Phillip Sousa even composed a “Transit of Venus March.” He dedicated it to American physicist Prof. John Henry, and it was played when the Smithsonian Institute unveiled a statue of John Henry in 1883. Let’s listen to it now. 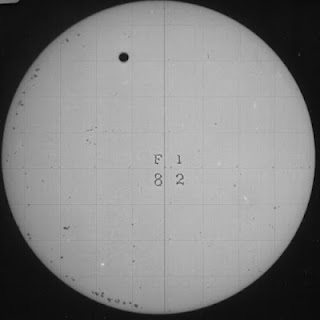 Try to imagine how excited people must have been to watch the transit of Venus in 1882. In 1882, the magazine Scientific American wrote “It is possibly the last time that so much scientific stress will be laid upon the transit of Venus. For before the next one in 2004, we have faith to believe that other and more accurate methods will be found for computing the sun’s distant.” They were right! In 1891, astronomer William Harkness concluded that the distance to the sun from the earth was 92.4 million miles, with an uncertainty of 1 million miles. He used measurements from the transits of Venus along with other astronomical data to figure out the distance. The next transit was not until 2004. People are still interested in seeing a transit of Venus because they are so rare. Here is a picture from the 2004 Transit. Today’s transit is 8 years later (remember they often happen in pairs separated by 8 years). The next pair of transits will not be until 2117! How old would you have to be to see that transit?